After 40 plus years of fine arts training and graphic design companies, design artist Jeffrey Coleson has finally figured out his own recipe for success. He calls his artwork, “self-illuminated sculptures.” Coleson’s modern themed light sculptures have come a long way from his Indiana roots. Growing up on a farm in South Bend meant two things: hard work and plenty of after school cartoon watching. VIDEO: Jeffrey Coleson talks about how his interest grew from studying midcentury modern architecture and art. Coleson recalls his love for drawing at an early age. “My teachers were a great source of inspiration. I knew this was all I ever wanted to do,” he says. In fact, his dad set up a little workshop in the basement of their home where he could design and create to his little heart’s delight. 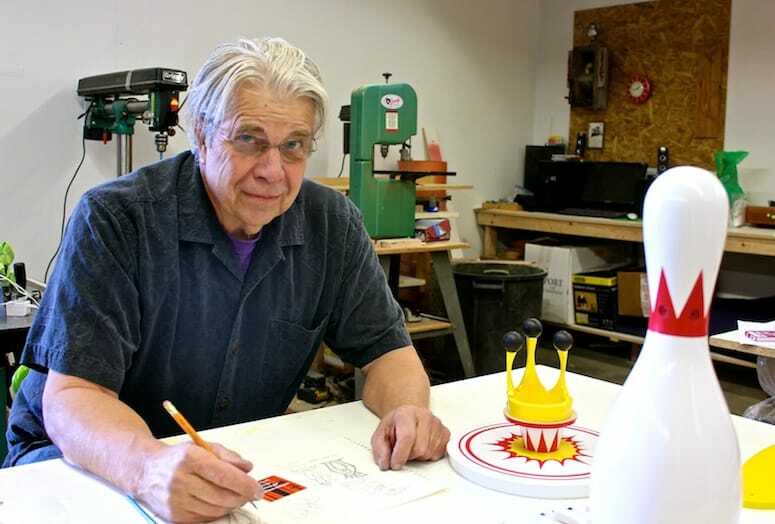 From the little workshop of his Indiana childhood to his current high tech design workshop in Palm Springs, Coleson continues to follow his passion for incorporating the fun and whimsical with a dash of religious modern design into his illuminated artworks. View Jeffrey Coleson’s art sculptures at a pre-Modernism Week event, 5-7 p.m. Jan. 29 at Wonderama, 464 S. Palm Canyon, Palm Springs. Visit www.jeffreycoleson.com for more information about the artist. Like what you’re reading? Then “Like” us on Facebook and “follow” us on Twitter. This illuminated art sculpture was inspired by Jeffrey Coleson’s childhood love of the Roadrunner cartoons. Years spent as a graphic designer in Seattle producing cartoon designed T-shirts inspired him to combine the two designs into this 3D art piece. Other salvaged and repurposed creations by Jeffrey Coleson include this repurposed light and music box, made from found objects from vintage architectural salvage places in Seattle. It comes equipped with a rotating doll head. Jeffrey Coleson calls his midcentury modern inspired art pieces, “Illuminated Art Sculptures.” Each art sculpture is painstakingly hand crafted, taking weeks to complete. Jack’s Coffee Shop art sculpture was inspired by Jeffrey’s love for all things midcentury modern. It also pays homage to his favorite coffee shop in Seattle. This illuminated art sculpture is made with LED lights and polycarbonate material that resembles water. This piece comes with its own trophy swimmer and vintage pool signage inspired by midcentury Googie style design. This illuminated art sculpture and radio, entitled “Viva Vegas,” was inspired for Jeffrey Coleson’s love of all things 1950s retro and the Rat Pack Vegas nostalgia.